In December of 2013, I decided to sketch out what my “ideal week” would be. I formed it to be attainable, yet challenging. Activities would be things I wanted to engage in now, and could begin working towards now. The rough timeframe I set was 6-12 months. What I did NOT do was set the bar unreasonably high. I have an idea what is and is not attainable in the short-term. I know adding an hour on Tuesdays to “go for a joyride in my Lamborghini” wouldn’t do me any good. But these small, attainable goals that move me in the direction I want my life to be are important. They help me to achieve my larger vision as I design my lifestyle around it. And so, my “ideal week” was born. It didn’t take long for me to realize I don’t enjoy jogging. It takes too much energy at 7am. I started doing The Scientific 7-Minute Workout instead. The circuit hits all the major muscle groups and it’s quick enough to fit right into my morning schedule. I recently started writing each morning just after I wake up, so exercise moved to about 9am when I need it the most. 100% accomplished: I’m proud to say I study every day. So far so good. I suppose this is here because I have to work. I did leave “Work” vague, but the point being it is only 5.5 hours a day. Based on who I am, I’m sure I will always work more than that. I love research, skill development, and attending conferences. This one is in purgatory as my work situation gets “figured out”, but I’m partially there at the moment. 50% accomplished: My hours have shifted towards this, but I’m still putting in plenty more. I’m not even sure how to rank this, so 50% it is! Powerlifting and the art of fighting. The physical and mental intellect and endurance that each sport requires is exciting. I’m glad to say I started training in MMA again months sooner than I imagined I would. In the gym, I started Wendler’s 5-3-1 program and gained a solid 5+ lbs. You make time for what’s important to you. 80% accomplished: Some minor injuries have set me back, but I’m making positive progress still. I read every day now, including weekends! The time of day I read varies based on how I feel each day. However, this enabled me to reach my 2014 goal of reading one book a month. Like with language learning, small, consistent progress is vital for growth. 100% accomplished: One book a month read! One of the easier steps towards my “ideal week”. I have to say, double dates are just not happening. I believe one extended dinner night with friends each week is important for renewal. Unfortunately, I have yet to find a consistent schedule. This one needs work! 0% accomplished: I can’t say I’ve accomplished anything here! Saturday mornings are the best time for a nice breakfast with friends or family. It’s a simple way to start-up after the workweek. This is another one I get done almost every week. It helps that this piece of my ideal week tied in with my 2014 goal of spending time with family and friends (and I love breakfast!). 95% accomplished: I miss a day or two, but it’s rare. Saturday breakfasts are a go! This one is a little sketchy. I have mixed skill development in with my “extra time” (see below), so I can’t say I dedicated three hours on Sunday to it. I can say I spend at least 3 hours on this, however. I think this is a goal of reaching a “low information” diet; but I love learning, so I’m not sure this one will happen! 90% accomplished: Not dedicated to Sundays, but doing plenty of skill development. The practice stage is still in effect for a few reasons. Let’s just say, practice at home is safe and easy. I get to play DJ and skip songs I don’t like, I get to control how long I do (or do not) dance, and I get to fluidly work dancing in or out of my day. We’ve been practicing Bachata and Merengue. For whatever reason, I had a more difficult time with Merengue, even though it’s a simple dance. I think I over-complicate it! 80% accomplished: One dedicated night to dancing hasn’t happened yet, but multiple dancing sessions throughout the week works! 80% accomplished: This time wasn’t planned, but I’ve been increasingly proactive, rather than reactive, with my free time. I’m doing well! My cellphone is still distracting though. I hate jogging. Love trail running, but can’t do that every day. Work at skill acquisition daily, but stop as soon as you are not enjoying it that day. It is unsustainable otherwise. You make time for what you truly love. Small, consistent progress is more powerful than what most people attribute to it (see spaced repetition). Your goals can change drastically in a short time, and that’s just fine (see #1). 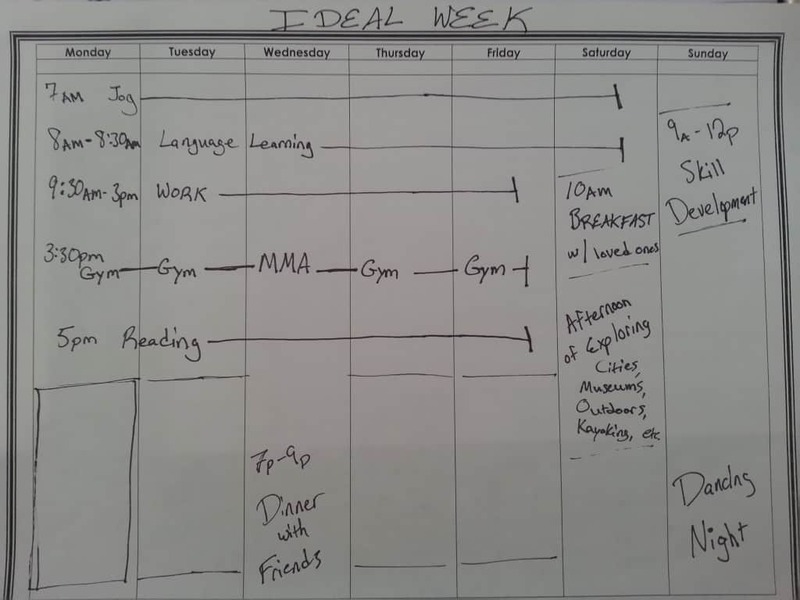 Then, check in on your “ideal week” after a few months pass. Where are you are succeeding? Where you are slacking? What have you discovered about yourself that changed your vision of the “ideal” altogether? On one piece, format the week to list each day. On the other, begin writing down your main “goals” you’d like to do each week. Shoot for one-word goals for now. Now, next to each goal we will elaborate with the SMART goal structure. To begin, be specific about your goal. Think of the W’s: who, what, where, when, which, why. Make sure your goal is measurable. What criteria can you set as a benchmark? Is it a quantity? When do you know you accomplished this? Attainability is vital for goals. You need to make sure that it is possible, so you aren’t reaching too high (like with my Lambo). In the same respect, you need the discipline to make sure it is challenging enough so you can’t say you already are there (like daily language acquisition practice). Remember, this is a 6-12 month time-span we are looking at. Your goals need to be timely if you expect to attain them soon enough. That’s ties into attainability. Setting milestone deadlines would be beneficial as well. Revisit in a few months and enjoy your progress and newfound understanding of yourself!